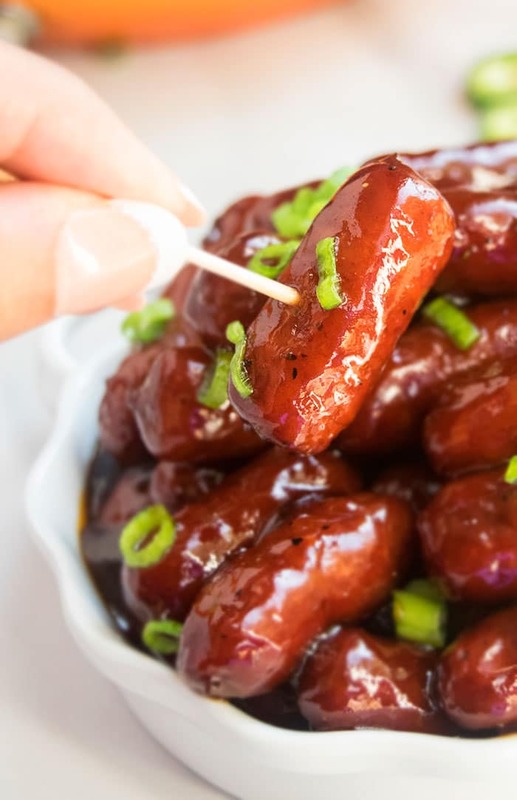 Quick and easy grape jelly little smokies recipe that’s ready in 30 minutes in one pot on the stovetop, using simple ingredients. Great appetizer or snack! 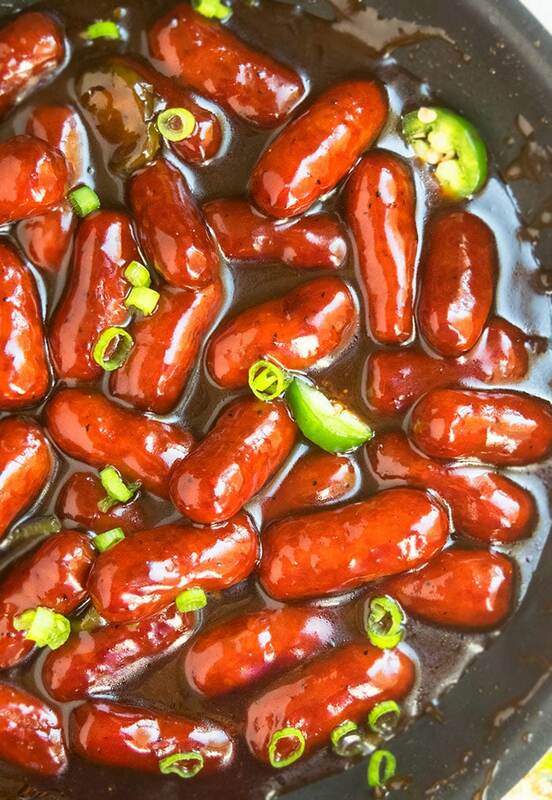 These grape jelly little smokies are a hit at every party I host. This quick lil smokies recipe is a great appetizer, snack or side dish that is sure to please your guests. It’s just as delicious as these other smokies appetizers: Crockpot Little Smokies (Cocktail Sausages) and Easy Pigs in a Blanket. Little smokies recipes are also known as grape jelly cocktail weenies or cocktail smokies! 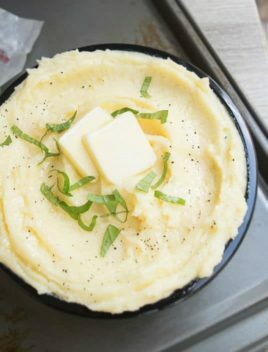 They are perfect for serving at the Super Bowl, movie night, game night and especially football season. 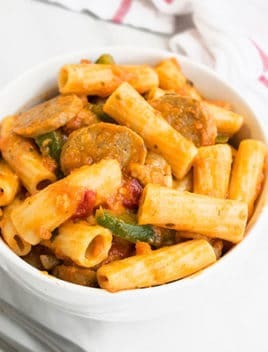 The little smokies sauce in this recipe is the best! You can add different herbs and spices that you already have in your pantry to give it a completely different flavor profile, every time. -If your sauce is too THIN, cook for longer on medium heat until the liquid is reduced. If your sauce is too THICK, add a little water to thin it out. 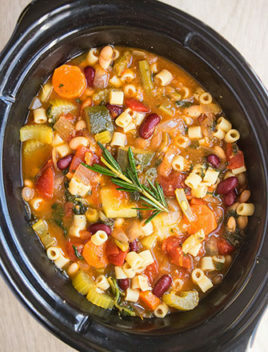 -You can make this recipe on the STOVE or in a CROCKPOT/ SLOW COOKER. If you make crockpot little smokies, I recommend using a liner in your crockpot to make clean up a breeze. -For a party, double or triple this recipe to serve a bigger crowd. -You can make these smokies ahead of time and store them in an airtight container in the fridge until you are ready to serve. 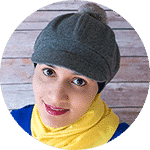 They can be REHEATED in the microwave or stovetop. -You can ADJUST the amount of chili paste based on your preference OR omit it entirely. 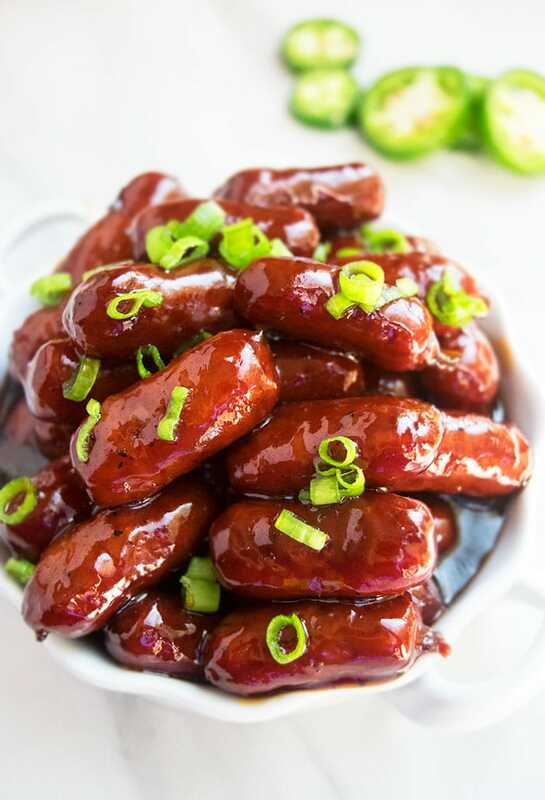 -Add 1-2 tbsp chili sauce, Sriracha sauce or some red chili flakes to make chili grape jelly little smokies. -Add 1/4 cup ketchup to make ketchup grape jelly little smokies. How do you make crockpot little smokies recipe? Combine bbq sauce, grape jelly, salt, pepper, garlic powder, paprika, and chili sauce and mix everything together. Stir in the mini sausages so they are fully coated. Cook on high for 2-3 hours or until cooked through. What is in little smokies? Smokies, in general, are made with different cuts of meat ground together into little sausage shapes and smoked. They can then be mixed with sauces and spices to make delicious appetizers. How do you make BBQ sauce with grape jelly? In a non-stick saucepan, add bbq sauce, grape jelly, salt, pepper, any other herbs and spices you like. Cook on medium heat until you have a smooth consistency. How to cook little smokies on a stove/stovetop grape jelly little smokies? 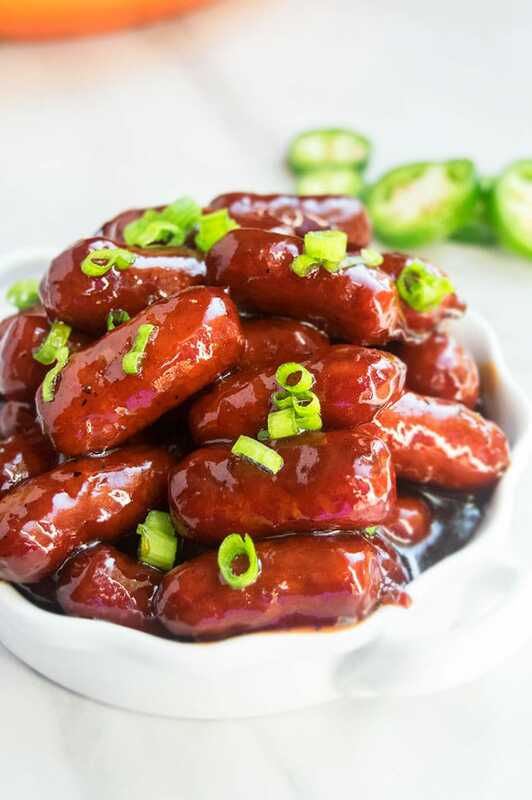 How to make little smokies? In a non-stick saucepan, add bbq sauce, grape jelly, salt, pepper, garlic powder, paprika, chili sauce and cook on medium heat until everything is combined. How do you make little smokies in a blanket? Cut crescent roll dough into triangles. Roll the little smokies in the them and bake for 12 – 15 minutes at 375 degrees. You can also wrap smokies in bacon and bake to make little bacon wrapped little smokies. How do you heat up little smokies? You can heat them in the the microwave or a non-stick pan on the stovetop. What goes well with little smokies? What side dish goes with cocktail weenies? 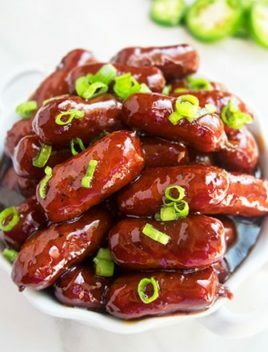 Quick and easy grape jelly little smokies that's ready in 30 minutes in one pot on the stovetop, using simple ingredients. 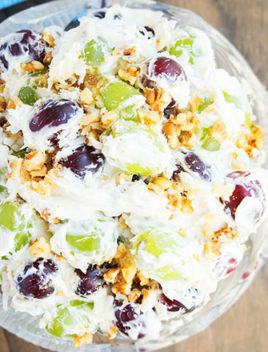 Great appetizer or snack! Add mini sausages and stir everything together. Cover and cook for about 8 minutes. Garnish with finely sliced green onions and enjoy. Such a classic and so perfect for entertaining! Such an amazing flavor! Looks so incredible! mmm..these look SO tasty! I can’t wait to try them! Love these. Would be perfect for a small appetizer. I’m sure these go very quickly at parties! Such a great appetizer! Perfect for a little party! These are sure to be a hit at parties!